BJP Lawmaker Raja Singh Aka Chowkidaar Copied ISPR's 'Pakistan Zindabad' And Level Hai Chori Ka! So it seems like the India-Pak fiasco has majorly affected the creativity of Indians! Let us tell you that this isn’t the first time that India has copied something from Pakistanis. And let us tell you that stealing songs is a very common practice of Indians. If you don’t believe us, check out the songs Munni Badnaam Hui, Mera Piya Ghar Aya, Lambi Judaai and many more! 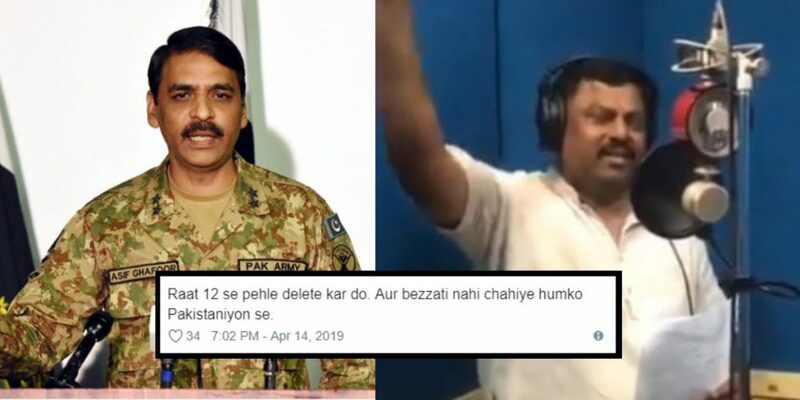 Just recently, Raja Singh, member of Bhartiya Janta Party Member of Legislative Assembly (MLA) copied (read: stole) a Pakistani patriotic song released by ISPR and tried to take all the credits by calling it his ‘own’ song and posting it on social media. Moreover, Raja Singh aka Chowkidaar released the song by barely making little to no changes at all. Before releasing the actual video, Raja Singh tweeted that he would release his “new song” on April 14 on the occasion of Rama Navami, a spring Hindu festival, dedicating it to the Indian army. Not only this but in his tweet, he posted a video of him singing at a recording studio and that’s exactly where things went wrong. Matlab is this a joke or what? And check out what ADG ISPR Asif Ghafoor had to say about it! We noticed. Everyone noticed. DG ISPR Asif Ghafoor noticed. The tune and lyrics with its tune and lyrics are almost the same as the original song by Inter-Services Public Relations (ISPR) song which was released prior to Pakistan Day sung by Sahir Ali Bagga. The lyrics of Raja’s song were exactly the SAME and the only thing that he altered was, ‘Pakistan Zindabad‘ to ‘Hindustan Zindabad‘. Check out the Indian (read: copied) version, doston! WHAT DID WE JUST SEEEEE??! And well, Pakistanis couldn’t but trolling the Indians – You guys cannot miss this! Abey saandh, Pakistani song kyun copy kiya anti-national? And how did Indians react to this chori? Have a look at it yourself! LOL. Raat 12 se pehle delete kar do. Aur bezzati nahi chahiye humko Pakistaniyon se. Abe apna dimaag se kuch naya bannaney ka tha nakal kiya woh saale ganna bhi pakistaniyon ka tabhi toh #pakistansupportsmodi samjha nakalchor billi raja singh. Bezti aisi ho, warna na ho! HAHA! Sharma Ji, Dushman Desh ko aur mauqa diya hamara mazaaq banane ka.Apne Desh mein kala koot koot Kar bhari hai, kisi bhi kavi ya shayer se likhwa leta aur gata Desh bhakhti geet. Chalo, at least the Indians realize the chori too! Tum log na hat jagha basti karwana. It’s absolutely sad to see how this song is an actual rip off the original. I mean, despite the situation between both the countries. Yup, this was indeed a very bad move! For those who missed out on the original song by ISPR, here you go! Got goosebumps? Same here! Don’t think Indians can up with something better than this, lol.